"Radioactivity is like a clock that never needs adjusting," writes Doug Macdougall. "It would be hard to design a more reliable timekeeper." 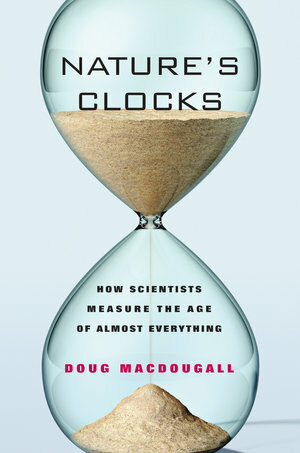 In Nature's Clocks, Macdougall tells how scientists who were seeking to understand the past arrived at the ingenious techniques they now use to determine the age of objects and organisms. By examining radiocarbon (C-14) dating—the best known of these methods—and several other techniques that geologists use to decode the distant past, Macdougall unwraps the last century's advances, explaining how they reveal the age of our fossil ancestors such as "Lucy," the timing of the dinosaurs' extinction, and the precise ages of tiny mineral grains that date from the beginning of the earth's history. In lively and accessible prose, he describes how the science of geochronology has developed and flourished. Relating these advances through the stories of the scientists themselves—James Hutton, William Smith, Arthur Holmes, Ernest Rutherford, Willard Libby, and Clair Patterson—Macdougall shows how they used ingenuity and inspiration to construct one of modern science's most significant accomplishments: a timescale for the earth's evolution and human prehistory. Doug Macdougall is Professor Emeritus of Earth Sciences at Scripps Institution of Oceanography, University of California, San Diego, and currently resides in Edinburgh, Scotland. He is the author of Frozen Earth: The Once and Future Story of Ice Ages (UC Press, 2004) and A Short History of Planet Earth. Chapter 1. No Vestige of a Beginning . . .